The intelligent control centre burns to all 15 drives simultaneously, ensuring all your data is duplicated efficiently and cloned exactly as it should be. Designed as a dedicated duplication machine, the Premium Blu-Ray Tower operates completely independently. No PC or Mac connection is required for operation, simply plug in the power and you’re ready to duplicate discs in less than a minute. StorDigital . 1 . to . 15 . Blu-Ray . Premium . 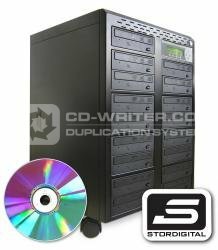 Duplicator .